Happy Passover, everyone! Ok, so let me start by saying that this is not a cookie, but it IS really good. Anyway, my friends and I had our seder on Friday night (the night before Passover starts) because it was more of a non-denominational seder with fantastic food (no fasting here…). We started with some smoked salmon and salmon caviar (Kosher, although sturgeon is not) and makeshift matzoh crackers (bad Manischewitz for having a Tam Tam shortage!) and cream cheese and smetana (Russian sour cream). Then we did our seder and enjoyed our fabulous meal of prime rib with roasted garlic and horseradish crust, beet, onion and horseradish relish, tzimmes, charoset, matzoh ball soup and salad with orange-fennel vinaigrette. For desert, I brought along this chocolate torte with blackberry coulis (also Kosher for Passover) and the pareve chocolate chip cookies, which I posted earlier this week (I also did the matzoh ball soup and the salad). The torte and the coulis were both a hit. In fact, people were actually drinking the coulis, which I take as a compliment. 2. Preheat oven to 350°F. Coat a 9-inch-diameter springform pan with margarine and line bottom with parchment. 3. Stir 10 oz semisweet chocolate, the unsweetened chocolate and 10 tbs margarine in double boiler over low heat until smooth. Whisk in espresso. Cool 10 minutes. 4. Beat eggs and sugar in large bowl on high speed until thick, about 6 minutes. Fold in chocolate mixture. Pour batter into prepared pan. 5. Bake torte until dry and cracked on top and tester inserted into center comes out with some moist batter attached, about 42 minutes. Cool in pan on rack 1 hour. Do not worry if the centre falls – it is supposed to. 6. Using spatula, press raised edges so top is level. Cut around pan sides and remove sides. 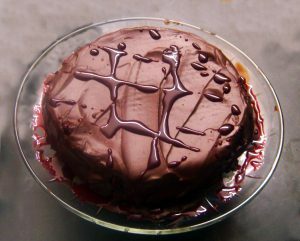 Place plate atop torte and invert onto plate. Remove pan bottom; peel off paper, and cool torte completely. 7. Cut torte into wedges; spoon coulis alongside. Garnish with mint and berries, if desired. 1. Place berries in a blender with wine and 4 tbs sugar and puree. Pour into medium sauce pan. Add the cloves, bay leaves and allspice and bring to a simmer, stirring occasionally. Reduce heat, cover and let simmer for about 8 minutes. 2. Strain into a bowl and discard the solids. Whisk in the brandy and remaining 2 tbs of sugar. This can be made up to 5 days in advance.